In her new book, the longtime organizer recalls her life as a grade-A troublemaker. Cecile Richards is somehow both an eternal optimist and a straight shooter, two characteristics that propelled her to fame on what was supposed to be one of the worst days of her career. In 2015, the now-outgoing president of Planned Parenthood testified for more than four hours in front of a Congressional committee that was investigating the discredited, heavily-edited videos which purported to show the sale of fetal tissue for profit by her organization. Testifying in front of Congress over a perceived wrongdoing is almost surely never fun, but that day she was grilled about everything from her salary to her apology about the tone of the employee in the video. She now appreciates the moment as a triumph. Looking back on that day, which meant enduring a lot of mansplaining and aggression, she laughs. “I’ve realized now what an opportunity they gave us, to talk to millions of people in this country about what Planned Parenthood does,” she says. “I know that wasn’t their intention.” Richards was hailed in headlines for her wit and her composure, and the committee cleared Planned Parenthood of any wrongdoing. 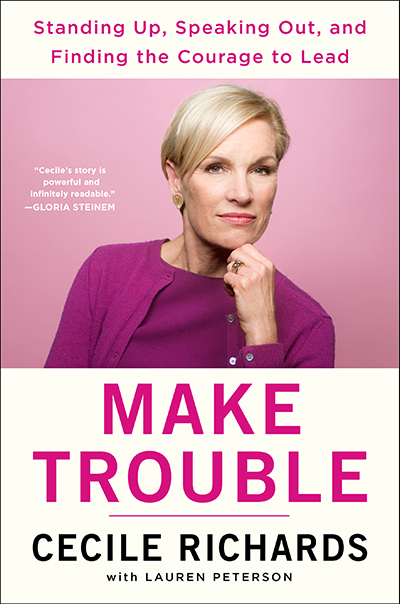 In her new book out Tuesday, Make Trouble: Standing Up, Speaking Out, and Finding the Courage to Lead, she recalls that day and many others that required her to be a supreme troublemaker and hellraiser. The part-memoir, part how-to-manual is written with her signature no-nonsense Texas charm and aims to broadly inspire anyone who wants to make a difference. Richards details her work as an organizer long before she took over as president of Planned Parenthood in 2006, from the time she was a schoolgirl wearing a black armband to class to protest the Vietnam War to recruiting for labor unions to serving as deputy chief of staff for Nancy Pelosi. She also recounts her time working on her mother’s campaign for governor of Texas, and the crushing defeat that followed when George W. Bush beat Ann Richards for what would’ve been the elder Richards’ second term. Her book is a rallying cry for women from all backgrounds to get out and make change, regardless of how ill-equipped they may feel—she makes no bones about how her work has always included a lot of improvisation. Mother Jones recently talked to Richards, just weeks before she’s set to leave the organization for which she’s long been synonymous, about whether she could ever see herself as a candidate, her mantra for this generation, and her own #MeToo moment. Mother Jones: When I was reading the book, I was really tickled by your mom [Ann Richards] quoting Mother Jones [the labor organizer, for whom this magazine is named]. Cecile Richards: I’m telling you, it’s the truth. Isn’t that crazy? She loved her. MJ: What made this the right time for you to write your memoir? CR: After the election, everyone was trying to figure out what to do. I couldn’t walk out the door without someone stopping me and saying, “What am I supposed to do? And how can I make it all go away? Or make it different?” It seemed like a good time, since I’d been an activist my whole life, to write a book and think about it some. It turned out to be, yes, a bit of a memoir, but also I hope a little bit of an encouragement or call to arms. I think one of the myths in the world is that somehow being an activist or a troublemaker is burdensome, or you’re always depressed. People would also walk up to me and say, “How are you doing?” Actually, I feel like being an organizer and an activist gives you such a chance to make a difference in the world. It’s really an incredible life, and so I hope that what this book also gives people is a sense of the joy that you can get from making a little bit of difference in the world and the amazing people you meet along the way. MJ: Yeah, I read it as almost a how-to for a life in activism. CR: That’s kind of what my husband and I have done. It’s been great. MJ: What do you hope young women take away from your book? CR: That you don’t actually have to know how it all works out or exactly what you’re doing. It’s more important to just get started. I think the mantra for our time should just be, “Get going before you’re ready.” And certainly, there’s a number of things I’ve jumped into in my life that I had no idea what I was doing, and somehow it all just kind of worked out. My mother raised four kids before she ever got to do anything on her own, really. And those were the days when women had few opportunities, and so it wasn’t until we were practically grown that she finally had the chance to run her own campaign, for a woman who was running for the state legislature, Sarah Weddington. And then eventually, [my mom] ran for governor. I think what it taught her, and what she relayed to me and my siblings, was, “Boy, you should just get busy and get going now.” And for goodness sake, never turn down a new opportunity. I still see women worry that they’re not ready for this next job, or that they don’t have the right degree, or they didn’t take the right classes. Men never say that. I hope that the lesson that women get, not just from this book, but frankly from this moment we’re in, is that this is the time to just get going. It’s really exciting to me to see so many women—including young women, including women of color—running for political office that they probably never dreamed about before. MJ: Speaking of taking new risks, what made this a good time for you to leave Planned Parenthood? CR: I guess I’d always thought I’d probably stay about 10 years ’cause I am a bit of an itinerant. I stayed a little longer because there were things that we needed to get done. I’m really a big believer in bringing along and investing in the next generation. We’ve done a lot of that at Planned Parenthood. Whatever I do after Planned Parenthood, it’ll be in the resistance. One of the things I’m proudest of is that the organization is now bigger. We went from about 3 million supporters to more than 11 million. It’s more diverse. We’ve got so many young people that have come in as, not only as activists, but now as organizers and staff. I believe that part of leadership is not just talking the talk, but walking the walk. It’s probably the best progressive job in the country, but it’s also important to move aside and make room for somebody else. I know that whatever I do after Planned Parenthood, it’ll be in the resistance. I can use the things that I’ve learned and I hope the skills that I have to further social justice in some other way. That’s what I’m going to figure out. But it’s not easy to leave, I’ll be honest. MJ: What scares you the most about leaving? CR: I’m just not a scared kind of person. There are so many issues that I care about and so much going on right now. I think what would scare me is if I saw this administration, this Congress, just running roughshod over people and nothing happening. Actually, as an organizer, I’ve seen just the opposite. I’ve never seen more activism, more energy, more people jumping in that have never done anything before. The unknown doesn’t really scare me. Apathy would scare me, but I’m not seeing it anywhere. MJ: Often Planned Parenthood is seen as this massive, established force in the political world, but your background is really in grassroots organizing. What lessons did you take from your work organizing labor unions and doing on-the-ground campaigning into your job as president of Planned Parenthood? CR: I’d say first that Planned Parenthood is strong because we’re in all 50 states in America, on the ground. That is what a movement really is about. I definitely learned from my brief stint on Capitol Hill that everybody who’s serving up there came from somewhere else. Where you really need to build power is back home. That’s been reinforced. I think one of the things that I also learned is make sure that everyone who comes through our doors for health care is informed about their rights, and to all extent possible, registered to vote and participating in the democracy. I think of all the new members we’ve gotten since this new president, almost half of them are patients or former patients. To me, that’s a really exciting thing—when the advocacy side is in sync with the health care side. When I started as a union organizer, we were kind of at the bottom of the totem pole. The whole dream of the labor movement was if you could ever work your way up, you could become a business agent or you could negotiate contracts. I learned a lot from my boss at the time, Andy Stern, who believed that organizing was the most important work and that if we didn’t fund organizing, we would never grow. I really took that lesson to Planned Parenthood. I believed that, unless we started investing in young people, we weren’t going to grow and we weren’t going to change. We made a very intentional decision to do just that, and that’s how we’ve grown to be both as large as we are and I hope as relevant as we are to young people in America. I’d rather people be idealistic and unrealistic than practical. Of course, since I’m leaving after 12 years, I think about things that I experienced when I came in and what has changed. Back when I started, it seemed like every event I went to for Planned Parenthood, someone, an older woman usually, would stop me and say, “Where are the young people? I feel like we did all this, we fought for their rights. They’re just taking it for granted.” I never hear that anymore, because young people are everywhere at Planned Parenthood. Again, I think that’s just something that takes time. It takes resources. Takes investment. And it takes a willingness for people to let young people lead. That’s really exciting. MJ: What should the next president of Planned Parenthood know? CR: Oh, no, I hope the next person just makes it what they will. I had no idea what I was doing when I came in. I hope that someone else can come in, and not feel like they have to know what they’re doing. It’s also one of the reasons why I think it’s important for me to step aside and make room for someone else. Change is good. The world is changing so fast. It’s exciting to think of someone else coming in and making their own mistakes, and making their own progress. Dreaming big, and then making it happen. I think that’s really great. It’s funny, it’s not really just about Planned Parenthood, but this magazine reporter interviewed me the other day about my book. She said, “What are the things you wish you knew back when you started as an organizer, or in your life?” I really thought about for a minute, and I realized that actually there really isn’t anything I wish I’d known before. Because if I had, I would’ve never tried some of the harebrained campaigns I did, or started organizations from scratch, or tried to elect the first pro-choice woman governor in the state of Texas. Those are things that seemed so crazy, and yet some of them, we actually did and we succeeded. They were able to both have their own personal feelings about abortion, but also say that it’s not their right or the government’s right to make those decisions for everybody else. I don’t want anyone to come in and feel like they have to know certain things or do certain things. They just need to be ready and excited. Look, we’ve got a 100-year legacy. I can’t wait to see what the next 100 years are like. MJ: You feel like not knowing too much was an advantage, in a way. CR: Yeah, I worry that being too practical can really make you question your ideals. I’d rather people be idealistic and unrealistic than practical. And as we all know, if you work in social justice, you only get what you fight for. You don’t get anything more, so you might as well go for the whole thing. MJ: Do you think there’s room for pro-lifers in the Democratic party? CR: There are pro-life Democrats in the Democratic party. There are pro-life people everywhere. I think the question is, what do you want the government to do about the issue of abortion? And I think that Conor Lamb is a really good example of a candidate who has his own personal feelings about abortion but has said very clearly he doesn’t believe the government should be making those decisions for pregnant people. That to me is the definition of being pro-choice, really, if you get right down to it. That’s where the American people are. One of the most interesting experiences I’ve had here were the battles in South Dakota and Mississippi where they tried to make abortion illegal. Those are very conservative states. In fact in both those states, people voted overwhelmingly to not support a ban on abortion. Because they were able to both have their own personal feelings about abortion, which people do and which we should respect, but also say that it’s not their right or the government’s right to make those decisions for everybody else. That is where I believe the American people are. I wish this wasn’t a partisan issue. I don’t see why it should be; in fact, many Republicans started Planned Parenthoods all across the country. But to me, one of the most fundamental libertarian values is that the government stays out of people’s personal lives. In this era of Trump, support for Roe is at its strongest ever. In part, that may be because people realized their right to safe and legal abortion was at risk, but I also think it’s become more and more accepted in this country that it is a fundamental right. In my heart, I’m an organizer and an advocate. MJ: In the epilogue of your book, you briefly mention your own #MeToo experience. Would you be comfortable talking more about that? CR: I don’t know that there’s really that much more to say, except that I had an employer who definitely took liberties with me. I was a college student. I didn’t really know what to do, and it wasn’t a time in which you could…I mean, I couldn’t talk to my parents—that was sort of unthinkable. Unfortunately, I think it was the kind of situation where we just all chalked up to, that’s the way it is, particularly if you had a job you didn’t want to lose. Of course now, I wish I had been braver and had called him out. But I didn’t, and I think it’s incumbent on all of us to make sure that another generation doesn’t have to go through what we went through. I’ve been amazed and, frankly, so inspired by my own kids and by other young people who think it’s completely unacceptable that people would be sexually harassed on campus or at work. I think for my generation, that was just how it was. And it’s not acceptable, ever. MJ: A lot of people have speculated that you will run for office. Is there any truth to those rumors? CR: I don’t know what I’m doing next, so I don’t want to say I’m never running for office. I didn’t leave this job in order to throw my hat in the ring for president. Let’s just see what the competition is out there first. Honestly, I’ve thought about running for office before, so I’m not trying to be coy. In my heart, I’m an organizer and an advocate. I’ve always felt like I’ve had these amazing opportunities to make a difference in the world by working with other people. I know when I leave this job, I’m going to be very focused on making sure that women, and particularly women of color, have the opportunity to participate in this election. Whether it’s as candidates, or advocates, or activists, or voters. I feel like women are shaking the foundation of everything going on in this country. This is an organizing moment, and I really want to be part of it.